DOTHAN, Ala. — Florida State was closed last Monday in observance of Memorial Day. There were no football meetings, no classes and no workouts for many of the football players already on campus preparing for the fall season. These college student-athletes could’ve gone anywhere for their long weekend – back home for a cookout or to the beach with friends. 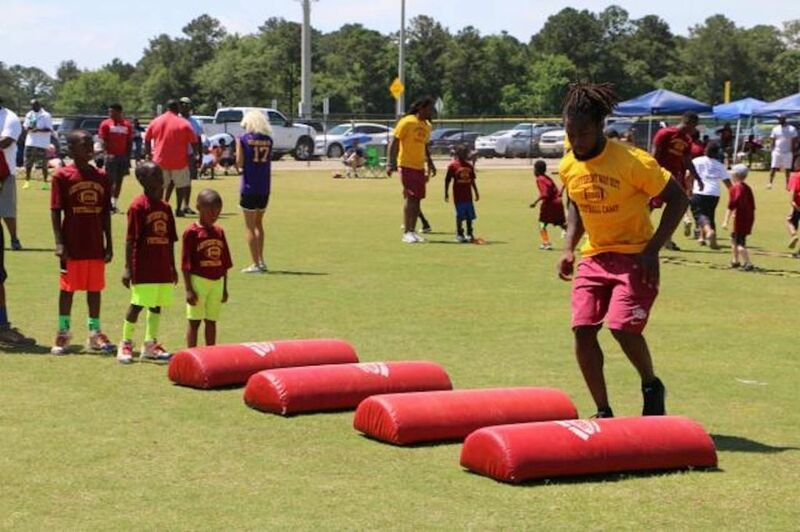 Instead, several FSU football team leaders woke up early on Saturday morning and drove two hours to Westgate Park in Dothan, Ala., to help their teammate, Marquez White, at the “A Different Way Out” Football Camp. White was instrumental in helping Northview High School football coach LaBrian Stewart organize the free, all-day camp for 100 kids ages 3 to 14. Joining White at the camp were teammates Dalvin Cook, Travis Rudolph, Derwin James, Ermon Lane, Nate Andrews, Justin Shanks and former FSU defensive back Lamarcus Brutus, who is now with the Tennessee Titans. Several other college football players and area youth and high school coaches also volunteered at the camp. White considered leaving early for the NFL following a standout junior season where he started every game and developed into one of the Atlantic Coast Conference’s top cornerbacks. On this Saturday afternoon, he stood in the corner of an athletic field dressed in shorts, dry fit leggings and a yellow camp t-shirt, sweat dripping off his body from demonstrating numerous drills to campers. It’s nearly 100 degrees in his hometown and there was nowhere he’d rather be. He pointed at an adjacent field and, with a smile on his face, said that’s where he played his first-ever football game as a sixth-grader. A recent phone call with his mother, Teresa [LT1] Thomas, sparked White into action. White listened to his mom tell him about problems in the community, with young men getting in fights and bringing guns and drugs to school, and knew he had to act. “A Different Way Out” was born after White talked to Stewart, who organized the event along with others in the community. Thomas and several other parents and Dothan residents handed out hot dogs, hamburgers and bottles of water to everybody in attendance. The city didn’t charge a fee to use the park, either. Each Seminole player had a station and led a drill similar to Florida State’s Fourth Quarter offseason conditioning program. Clad in a Florida State bucket hat, Shanks looked like his position coach, Associate Head Coach Odell Haggins, while playfully barking out orders and pointing which direction for kids to run, stop and slide at his station. Cook led a quick feet drill and was a constant encourager. He was right next to Lane, who guided a similar drill. Andrews, James and White sprinted through cones while leading and teaching drills. Andrews even demonstrated a bear crawl. Rudolph, normally soft-spoken, couldn’t wipe the smile off his face as he challenged kids to race each around the cones at his station. Brutus, who had to be back in Nashville for offseason training with the Titans on Monday night, jumped in where needed and even spent time serving as a photographer for the event. After a few hours of drills, the players took a break and took photos and signed autographs for kids while mingling with their families. After the break, the players taught an FSU football camp staple to the participants, “Nole Ball” – a fun game that combines elements of football with ultimate frisbee – and broke into teams to compete for the rest of the day.